This book addresses what may be the most important and yet most unexamined presupposition related to ministry today defining success. Secular values beckon us to adopt the world’s way of thinking linked to most everything we do, and often we conform to cultural norms without even knowing it. There is the continual push for higher and greater results. When we idolize results that we think please Him, we actually fail to exhibit the obedience He asks of us. So what should ministry look like? Jesus instructs us to follow Him. When we do we find ten characteristics from Christ¹s earthly ministry that are also evident in the early church. We call this the kingdom path. 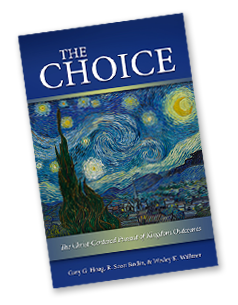 This book points the way and invites each and every reader to make the choice to take it. If this sounds oversimplified to you, candidly, we think we are the ones who have complicated things. Remember, Jesus recruited ordinary, mostly uneducated people and gave them basic instructions. He used words like "follow," "trust," and "obey." Are we following His clear instructions? When we pursue the kingdom path, then fruitfulness, or kingdom outcomes, are the by-product. The kingdom path is the only path that leads to kingdom outcomes. Meet the authors who catalyzing a movement of Christ-followers to pursue kingdom outcomes by charting a course for us that is biblically faithful and that positions the ministries we serve for fruitfulness. This page features the table of contents, a sample chapter from the book, a study guide, and other resources for helping stewards take action and rally others to pursue kingdom outcomes. The Choice is impacting stewards around the world who are weary of defining success as producing earthly results and instead have chosen to take the path that leads to eternal rewards.